In the past week or so Z has decided she doesn’t like walnuts…so I decided the crunch factor would be almonds and I would crush them just in case so there would be no kid texture issues. 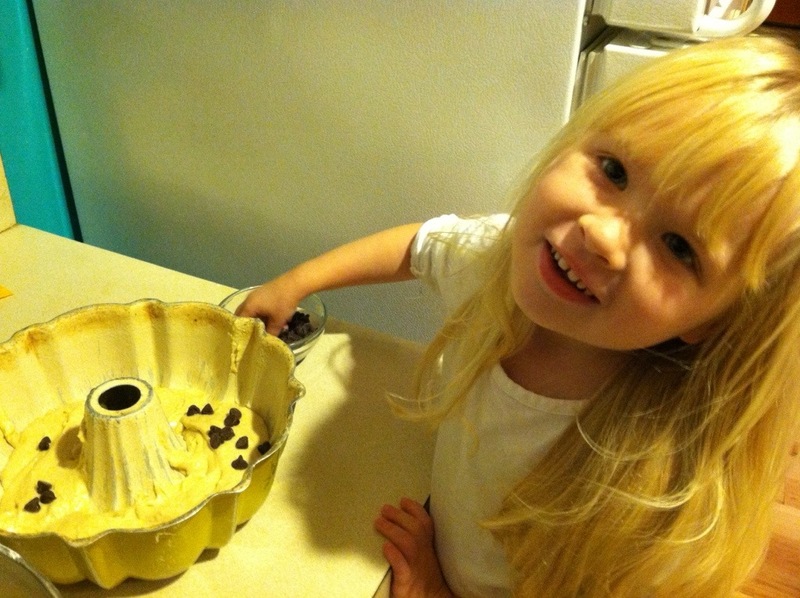 She wanted to include chocolate chips. And we my friends, are no strangers to having chocolate with/for breakfast. A recipe was born. I used a bundt pan because I thought it would look pretty when done. Spray or butter it generously. I used Trader Joe’s coconut oil spray. I tried to let Z do this, but it was sort of a fail, she got more spray on the counter than in the pan BUT she is learning that she needs to spray- so whatever. I resprayed. In a medium bowl add flour, baking soda and salt. Sift together and set aside. In a small blender add almonds, cinnamon and white sugar. Pulse until blended. (Z’s favorite part). Add melted butter, pulse until incorporated and slightly sticky. Set aside. Beat butter and brown sugar together in a standing mixer until blended and sort of fluffy looking (2-3 minutes). Add eggs, one at a time ensuring they are mixed in before adding the next. Add sour cream and vanilla. We used a 1/4 cup for the sour cream to make it easier for Z’s small hands to dump into the mixer. While she did this- I added the vanilla. Beat until everything is mixed. Scrape down and then add the flour in quarters, scraping down as needed. I find the flour part the messiest- as Z inevitably gets a lot of flour in the mixer and floor. Add half the cake mix to your bundt pan. Next sprinkle the chocolate chips and the almond mixture. Then top with the rest of the cake mixture. Z and I used our hands to spread the top mixture to cover the chocolate almond mixture. Place in the oven for 45 minutes. I tend to check at 30 minutes to see how it’s doing. Cool for 10 minutes then flip out onto a plate or cake stand. While waiting for it to cool my cat decided to help himself to a chunk (nasty) so I had to ‘trim’ the cake before serving. Argh- my cat thinks he’s human. 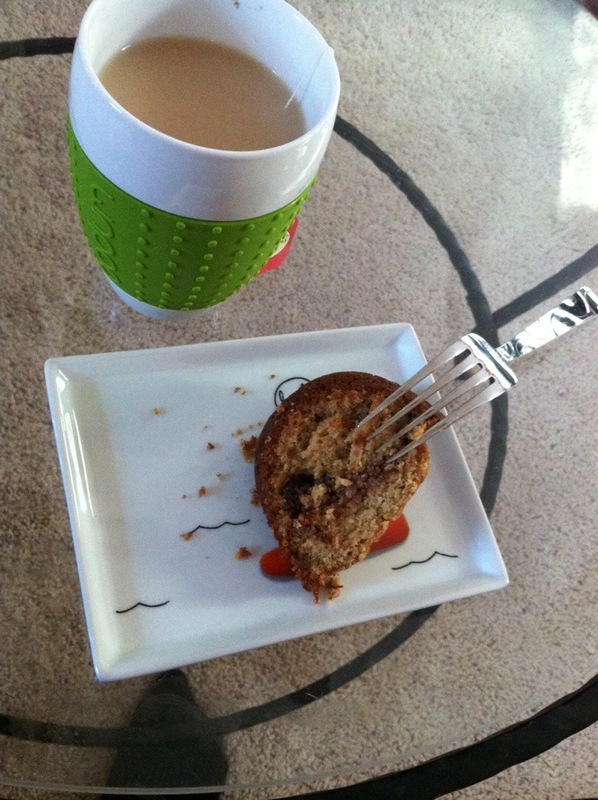 Mmmmm….coffee cake for breakfast, I haven’t done that in awhile, feeling inspired, think I will cook some GF coffee cake this weekend! Oooh that sounds fab! It was amazing this morning for breakfast!